Here's your guide to fun times in PCB including Fishing Piers, Golfing, Karts, Stand Up Paddle Boards, Waterfront Dining and Nightly Music. Have too much fun and enjoy your vacation. And remember to book your beachfront accommodations from an assortment of affordable vacation condos. If you can benefit from some local assistance in planning your vacation in Panama City Beach, phone our friendly PCB office and speak to a real person on the phone today. Fishermen have four very nice fishing piers to choose from in Panama City Beach. If you are a fisherman and want to fish far out into the Gulf of Mexico, or have a chance to cast into the Grand Lagoon, PCB has a fishing pier for you. The Russell-Fields Pier and the M.B. Miller Pier are very popular becuase each one extends about 1,500 feet into the gulf and some pretty good fishing waters. Non-fishermen also enjoy the piers including photographers for excellent opportunities morning, day amd night. The cost to fish from either pier is $6. This price includes your daily fishing license, and discounts are available for seniors, military, and disabled persons. Children 6 years of age and under are free, and seasonal or annual passes are also available. Spectators to the Russell-Fields Pier pay $3 for a day pass, while the M.B. Miller Pier charges $2/day for spectators. Passes purchased for one of these piers can be used at either. Thanks to affordable greens fees and tee times available year-round, people from across the country go to Panama City Beach to have some great fun on the links. PCB has five championship golf courses and plenty of sunshine, making it one of the Top-3 golfing towns in the US according to Golf Digest. 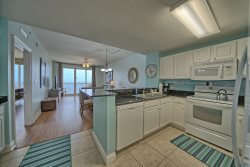 Book a golf vacation to Panama City Beach, and enjoy your time off the courses too in one of our affordable condo rentals along the beach. Street legal golf cart rentals in Panama City Beach are a very popular way to get around. Golf carts make your vacation even more fun, and convienent. If you�re staying in Panama City Beach and want to cruise the Emerald Coast, get a golf cart, also called Putt Putts and Buggys. Some vendors will deliver your street legal golf cart, and these vehicles are great for events too, such as weddings. Rent a golf cart, and enjoy a nice drive on the beach. You will probably see early morning adventurers taking advantage of the calm ocean waters and playing and exercising in a fun way, called stand up paddle boarding. You might think it looks difficult, but stand up paddle board (SUP) is actually easier than you think. SUP is also a great way to see our variety of marine life and meet others on vacation too. Here is a good read on SUP that will help you decide to make paddle boarding fun for you. Below are a few of the local SUP shops here on PCB. Yummy Gulf Coast Seafood, and plenty of it! Add equal parts great music with a little dancing, and the outcome is too much fun in Panama City Beach. Dine bayside, beachside or boat side. And then add some nightlife to top off your evening. Panama City Beach is famous for after dinner entertainment. The area nightclubs offer excitement with live music and dancing, and our harbor-side decks offer moonlit romance.